The Miracle at Dunkirk in 1940 enabled the Allies to continue the fight against the Axis powers. The impromptu evacuation saved over 330,000 Allied soldiers. However, their weapons and equipment were abandoned to make room for more men in the ad hoc fleet. While the loss in materiel and vehicles was a huge blow to the Allies, there is no denying that this was the right choice, which allowed the evacuation of more soldiers and saving them from a long captivity and kept the structure of the Allied army units generally intact. The M4 Kangaroo, like many wartime implements, was born from necessity. Many of the previous Allied tracked infantry vehicles had been destroyed or confiscated at Dunkirk. The British and Canadian troops needed a viable Armored Personnel Carrier or APC to get their troops to the front lines quickly and safely. The Kangaroo program would become the answer for the British and Canadian troops. Granted, the British had numerous vehicles, including lorries, staff cars, tanks, and the Universal Carriers a.k.a. Bren Carriers. However, none of these vehicles were designed specifically to take troops directly into battle. The lack of an APC became more and more apparent as the war developed. Mobile warfare was the latest development, and the British had to keep up with the Germans and Americans. The earliest of iterations for the Kangaroo troop carrier design was based on the M3/5 Stuart platform. Out armored and out gunned early in the war, the Stuarts were relegated to support roles. As an APC, the turret of the Stuart was removed, and in some cases, the top of the hull as well. This allowed for more space in the tank, but left its passengers dangerously exposed. The Stuart Kangaroo served the British from Africa through the end of the war in Germany. However, it was not a viable APC, as it was too small and too thinly armored. 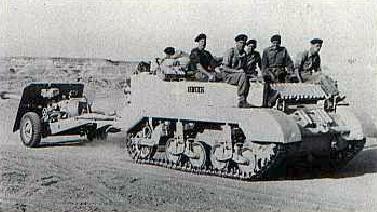 It did serve well as a replacement for the Bren Carriers and for towing artillery pieces. 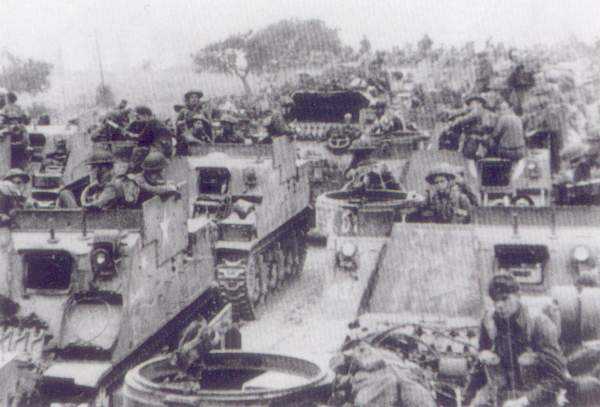 By 1944, the British were getting a few M3 Half-tracks from the Americans, but not enough, as by this point of the war, the Americans needed them as badly as the British. Universal Carriers were also in short supply, as the British were spread throughout the globe. By the middle of 1944, the problem had become enough of a headache that Canadian general Guy Simonds ordered that his obsolete M7 Priests be retrofitted as APCs. The field workshop named “Kangaroo” converted seventy-two M7 Self-Propelled Guns into APCs, by removing the main gun and ammunition storage, then reinforcing the infrastructure and improving the interior armor. These new “defrocked” Priests served well as APCs, command vehicles, and observation vehicles. Eventually, the practice would transfer to outdated Canadian Ram tanks and British M4 Sherman tanks. For the M4 Sherman Kangaroo, the conversion process was relatively simple. Canadian mechanic crews took the turret off a Sherman and welded a plate behind the driver compartment. Then the ammunition storage was removed. This left the hull of the tank empty save the engine and transmission. This also reduced the chance of the M4 catching fire, which made it safer than the regular tank. The space could fit ten to twelve men, depending on the load-out of the troops. However, there is plenty of visual evidence that there were more than ten in and/or on the Kangaroos, as per military tradition to put as many bodies as possible on a vehicle. The Kangaroo was also armed with a .30 or .50 caliber machine gun, either in the hull or mounted on top near the turret ring. This was usually used to suppress the enemy and cover the infantry exiting the vehicle during battle. Even though the half-Shermans had an odd appearance and no main cannon, like their full-size counterparts, the Kangaroo proved itself in battle. The makeshift APC was all but impervious to small arms fire. The Kangaroos were obviously not going to engage enemy armor. They had one job: to get the troops to the front. 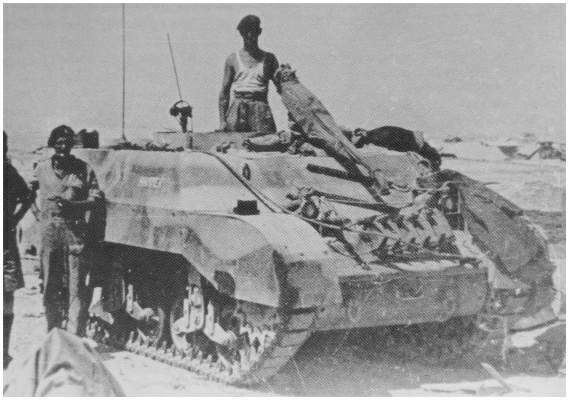 The Kangaroos (51 mm/2 in maximum armor on the hull) were able to accomplish this better than the M3 Half-track (12 mm/0.47 in maximum armor) or the Universal Carrier (10 mm/0.39 in maximum armor), as the armor was more robust and could stay in the fight along with the Allied tanks. The Sherman platform was a solid runner. It performed well both on and off road. By reducing the weight of the tank, it was even more effective in maneuvering. The M4 Kangaroo could go anywhere the Sherman could. This meant that the tanks had infantry support throughout the battle, from the initial advance to the pursuit of the enemy. It also meant the same for the infantry and its armor support. Having infantry alongside armor for an entire battle is one of the most effective uses and best examples of combined arms. The Kangaroo allowed the infantry to be fresh right at the point of attack. The infantry was not exhausted from marching to the battle. The casualties before the engagement were also significantly less with the Kangaroo. Instead of infantry marching into the fray, being exposed to enemy fire from artillery pieces, mortars, and machine guns, they were protected in the Kangaroo. This also meant that infantry units were deployed together en masse at the front, organized and ready to fight. The M4 Kangaroos made their debut in France during the victory of the Falaise Gap in August, 1944. They were so effective during the battle that the Canadian 1st Armored Personnel Carrier Squadron was created. It then expanded to regimental size by the end of the year. Eventually, the Canadian 49th Armored Personnel Carrier Regiment fell under the British 79th Armored Division. The 79th was made famous by Hobart and his “funny” tanks. 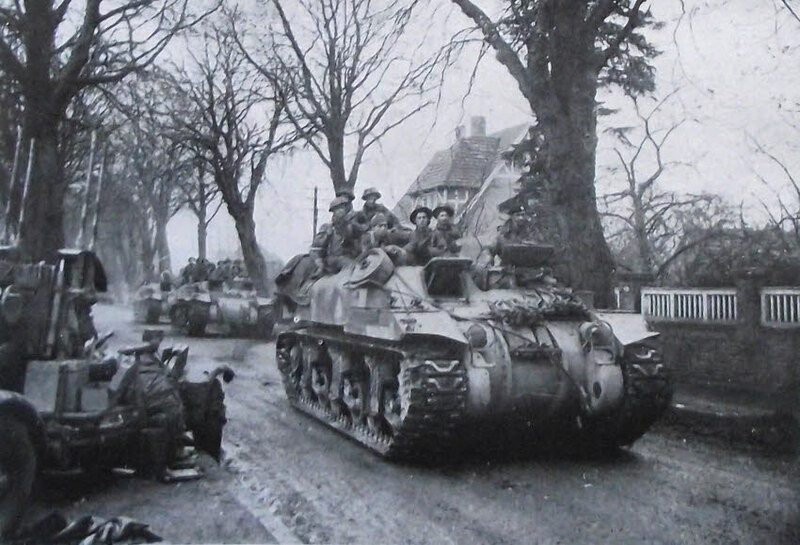 The M4 Kangaroos continued to carry the British and Canadian troops into battle throughout the balance of the war. 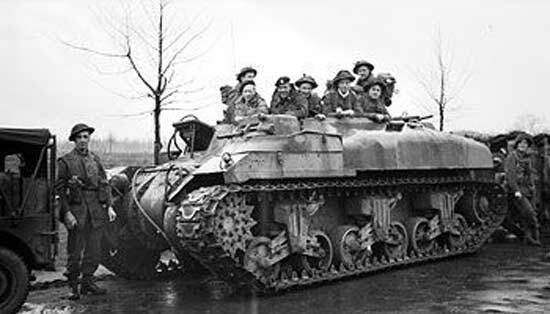 By repurposing the extra armored vehicles, the British did not need to go through the design process of making an actual armored personnel carrier, which saved greatly on time and design costs. After World War II, the Kangaroo program led to the design of a formal APC. This next step in warfare insured that the infantry would get into battle safer and fresher. It also insured that the armor had its infantry security with them at all times. The Kangaroo was born out of necessity by the Canadians and British. It proved itself in battle for the balance of World War II, and the Kangaroo’s success sparked the development of the formal armored personnel carrier. Hofmann, George. Through Mobility We Conquer: The Mechanization of U.S. Cavalry. Lexington: The University Press of Kentucky, 2006. Weinber, Gerhard L. A World at Arms: A Global History of World War II. New York: Cambridge University Press, 1994. A Stuart Mark VI Kangaroo, Operation Torch, North Africa, November 1942. The Stuart was the first chassis on which the APC conversion was tried, due to its obsolescence and inadequacy against contemporary tanks. New Zealand Army Priest Kangaroo, armed with an extra Boys rifle, Northern Italy, fall 1944. A Ram Kangaroo of an unidentified unit, Normandy, 1944. 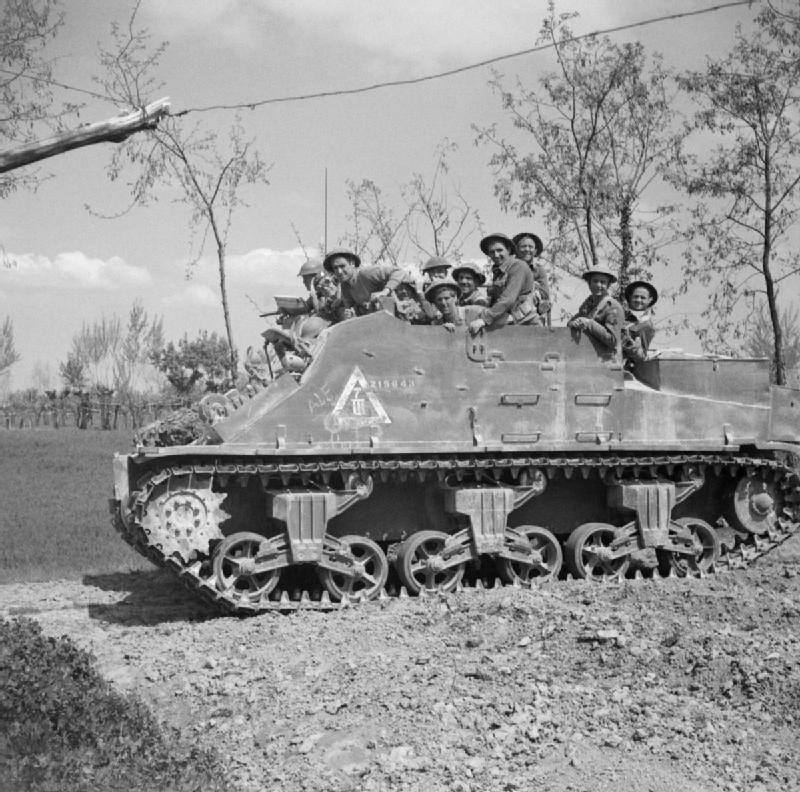 A Sherman III Kangaroo of a Canadian unit in Northern Italy, fall 1944. A Churchill Kangaroo in Germany, 1945 (not to scale). I am sorry Murray, we have little information about specific units. who did they get name Kangaroo ? New Zealand and Aussie troops that used them named them Kangaroo because of the compartment or “pouch” for the troops to take cover in.